The 31st Annual Weens Lecture and Resident Alumni Reunion will take place on Friday, September 26th at 6:30 pm in the Woodruff Health Sciences Center Administration Building (WHSCAB) Auditorium. The evening will feature a presentation by Virgil Wong, the Cofounder and Chief Executive Officer (CEO) of Medical Avatar LLC, a mobile health company that cuts health care costs by optimizing patient physician communication, reducing unnecessary procedures and decreasing hospital readmission rates. To RSVP by Friday September 19, 2014 click here. Wong is both a visual artist and researcher in medical cognition and intelligent technologies. He combines these unique perspectives to produce interactive installations, films, paintings, drawings, and prints. His works have been exhibited in galleries and museums around the world – including the State Hermitage Museum in St. Petersburg, Russia; the Museum of Contemporary Art in Taipei, Taiwan; and Deitch Projects in New York City. He produced and co-directed Murmur, a cardiovascular dreamscape film that premiered at the 2002 Sundance Film Festival. In the previous year, he received a grant from the National Endowment for the Arts (NEA) for an art and medicine exhibition called Corporeal Landscape. 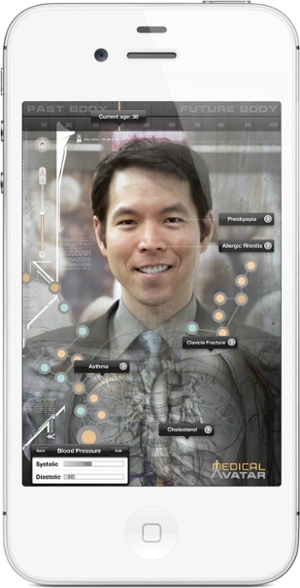 Through the vehicle of the Medical Avatar, Wong provides us with time travel simulations can increase engagement, motivate disease prevention, and improve chronic disease management. In 1996, Wong founded the Web & Multimedia division at New York-Presbyterian Hospital and Weill Cornell Medical College. Over 15 years, he defined the Internet strategy for both institutions based on one central principle: informed and engaged patients will help reduce costs, increase efficiency, and improve outcomes. As co-chair of Weill Cornell's Clinical & Translational Research Science Center (CTSC) Cross-Institutional Web Portal Working Group, he supported researchers in their efforts to expedite delivery of new treatments for patients in need. Since 2000, Wong has also been teaching photography, film, and interactive media as an adjunct Assistant Professor in The New School's Masters in Media Studies Program. He has also served as Vice President of Interactive Media at Element Solutions, a company that creates strategic technology solutions for hospitals and Fortune 500 companies across the United States. For more information, please visit www.virgilwong.com. Chronic diseases account for 70% of deaths annually in the United States – and more than 75% of the $2.7 trillion cost of healthcare. Good choices patients make day-to-day regarding nutrition, fitness, and stress management can reverse conditions like diabetes and heart disease and support decades of optimal health and well-being. In this presentation, we will see how Health Time Machines (HTMs) can shape personalized mental models and transform behavior over time. HTMs are futuristic 7' X 7' booths that generate realistic 3-D avatars of users that capture their physical likenesses, precise body measurements, and critical health metrics. Potential health changes are visualized on these "healthy selfies" and made accessible on mobile devices. Combined with on-going data tracking and best-in-class mHealth resources, HTMs promote positive health behavior changes and stronger relationships between patients, providers, and payers. Adherence is not dictated by external forces; it is an internally-driven set of decisions by the individuals empowered by the HTMs. Users see the future consequences of their own actions, weigh the pros and cons, and initiate daily behaviors based on personalized mental models of their own determination. Time travel simulations in the HTMs and apps encourage healthier lifestyles by helping consumers visualize the cumulative effect of their choices over time.